At the northern gate of Provence, the Vaucluse exudes a cultured air. Its rich past – Roman inheritance in Orange, papal legacy in Avignon, while the perched villages of Luberon seem purpose built for holiday homes. The villages are not perched by accident and the ramparts of Avignon were not for show – Defense was the motives for both. On Mont Ventoux , the Monts de Vaucluse or rmote parts of the Luberon, you are truly in Provence at its most elemental. When you venture east of Avignon you will witness the Provencal landscape, small villages, fruited plains and consistently fine cuisine. The quintessential village perche of Gordes, spirals up around a rocky outcrop above the imergue valley on the edge of the Vaucluse plateau. 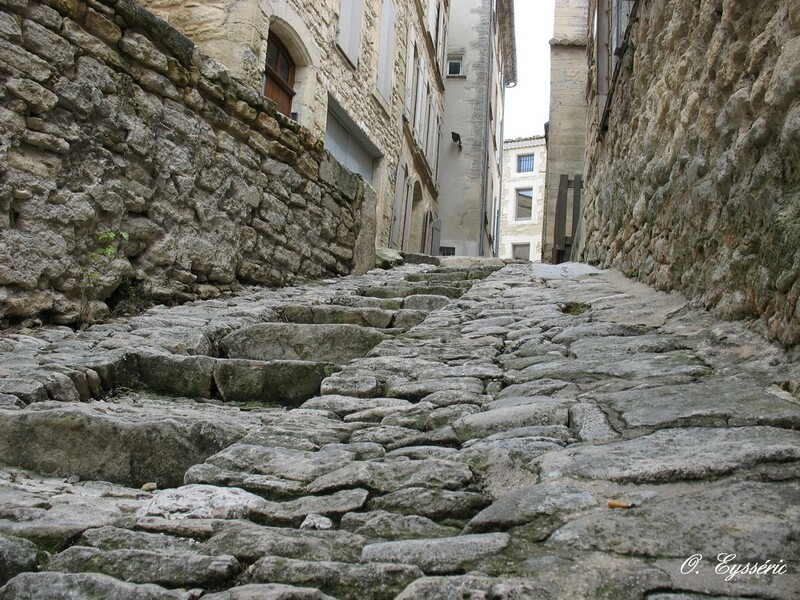 The Gordes village is threaded by small , paved alleyways called Calades fanning out from the center piece, the 1520 chateau. 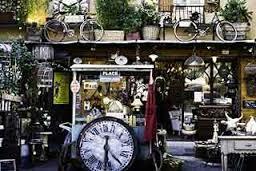 A display of oversize objects gives both Mick and Gerard Nicod’s antique shop in L’isle sur la Sorgue a dreamlike ambiance, it is probably one of the most famous Antiquaire and one that specializes in the detritus of old -fashioned country life. L’Isle sur La Sorgue is the antique mecca of the region, with probably more than 200 brocanteurs ( antiques dealers) and a huge Sunday morning market.It spills down the Avenue des quatre otages, where the merchandise is a mixed bag. The best merchandise is in the shops along the street. Some of the top antique dealers are Jean-Jacques Bourgois, owner of Vincent mit l’ane. 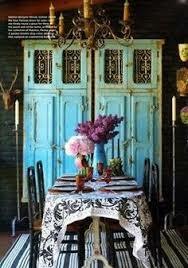 He specializes in antique Provencal chairs, such as 1800s walnut chair. Accurate reproductions are selected and manufactured by the owner Jean-Jacques Bourgois, an authority on the subject. Michael Biehn is an expert in traditional Provencal textiles, he carries a selection of 18th-century handwoven linen sheets as well as 18th -19th-century Provencal quilts, which are made of hand-block-printed cotton.It is a great shop with superb linens and fabrics. 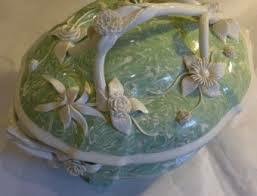 The Vaucluse has a very long history of artisanship. A few of their heirs are located in the Luberon. In the tiny town of Lumieres, Edith Mezard is known for her custom-made pillows and linens hand -embroidered with monograms or words. Brigitte Vanin’s showroom is located in Bonnieux, she specializes in fine tiles. It takes her one month to make enameled terra-cotta tiles and they are entirely handmade. 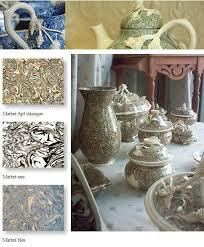 Jean Faucon’s studio is located in Apt and is one of my favorite marbleized faience. He uses an 18th-century technique revived by his grandfather. 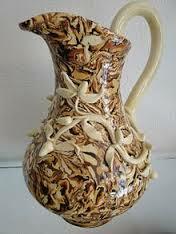 The swirling patterns are not due to the application of glaze but in the clay itself. 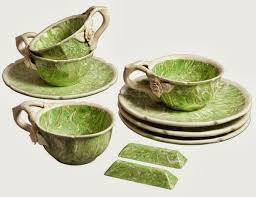 Faucon is the sixth generation of his family to handcraft Aptware ( marbleized faience) which gets its very distinctive look from the area’s colored clays: red, green, brown, white and yellow. Faucon will show visitors around his workshop, which is just outside Apt. Nicod Antique store in L’Isle sur la Sorgue.